Needless to say, a flooded house tends to put a crimp in the writing process, and NaNo 2010 ended up being quite a bumpy ride for me, as a result. If you want to have a laugh, go take a gander as I tell the tale of the whole sordid adventure. One of the downsides of all the real-life drama in the midst of trying to bang out 50k+ words is that my blog presence really suffered. I didn’t put up a single post between the 5th and the 26th last year, a mistake I was anxious to avoid again. But obviously, if I’m contributing every last word to my manuscript, how will I find subject material for blog posts, and will I have the energy to even think about it after a long day of fiction writing? So I was toying with this dilemma the other night. At the same time, I was also concocting a set of music playlists on my laptop to have at the ready for NaNo (music is a huge part of my writing process). Then it hit me: Why not post video/music during here at ~WSMG~ during NaNo? I can share songs from my playlists with you groovy folks, and maybe you guys will want to join in the fun too! Each day in November, I’m gonna put on my NaNo Video DJ hat and post one of my favorite videos here at ~WSMG~. The songs will be chosen from my collection of writing music to help inspire you guys, help us stay sane during the craziness that is NaNo, and totally rock out! Sound groovy? But it gets better: I’d love nothing better if you joined me. Go to YouTube (or the video site of your choice), pick one of your favorite videos, then put together a post featuring the video. To participate, post AT LEAST ONE video sometime during the month of November. If you want to post more, knock yourself out! (Here’s a tutorial on how to embed a video, if needed). If you put up three or more posts during NaNo, I’ll list you as a DJ! Comment (*details below) or send me an email at jpcircusboy@gmail.com, subject line ‘VIDEO’ with the details of your post, including your link information. LATE EDIT: Of course, you can send me a Tweet too (@skymeetsground)! Alternatively, like a real life DJ, I take requests! Tell me a video you love and I’ll share it here on ~WSMG~ myself, giving you full credit, of course. Each day, I’ll announce new videos, highlight the high points, and add them to the Master Playlist. Share some awesome NaNo writing music, and get a chance to hear the tunes everyone else finds groovy. Give everyone one stop shopping for a right rockin’ video playlist throughout the month. With any luck, the combined energy of all that awesome music will help us get across that 50k word finish line just a little bit faster! Who knows, maybe that really moving snippet of music posted by a fellow writer helps you nail a difficult scene or understand a character better. Even if you’re not doing NaNo this year, why not throw one of your favorite videos into the mix to support your fellow writers and let everyone else benefit from your good taste! You’ll find a badge on the Master Playlist post below for sharing, so feel free to put it up wherever you want to help get the word out. Please let folks know about this if you have a chance–and let’s rock out! I’m tapping my foot just thinking about how fun this Songfest is gonna be. Thanks, and stay groovy! Stay tuned later this week as there’s more pre-NaNo excitement in store. Carrie Butler, Melodie Wright, and Lisa Regan are sponsoring the Casting Call Character BlogHop. I’m playing. It’s sure to be a blast! Check my sidebar for details! I’ll also have some fun with loglines–especially the one I’ve been writing for my NaNo novel. Also check back on Wednesday for the final #REN3 Blogfest post. Have a rockin’ Monday, ya’all! ONE LAST THING: You DO NOT, under ANY circumstances, talk about WRiTE Club!!!!! DL Hammons said, I'm really looking forward to seeing/hearing the different types of music that will be posted! I'm always on the look out for new tunes! Tara said, I hope NaNo is a lot less damp for you this year! Jon Paul said, DL–Yeah, I'm hoping this'll be fun! I'm more curious to see what everyone else listens to than anything. Summer Frey said, I'll see if some of my favorites from my playlist have videos on the YouTuber. Fun fuN! Liza said, Fun idea JP. I don't write to music…though I think I should try. That said, I've got lots of songs on my playlist that inspire me. I'm going to ponder this. No NANO for me…again. My goal is to get to 50K BEFORE Nano…today I got to 47K and counting! The Golden Eagle said, I'm joining in–sounds like it'll be fun! Jo Schaffer said, Cool idea. 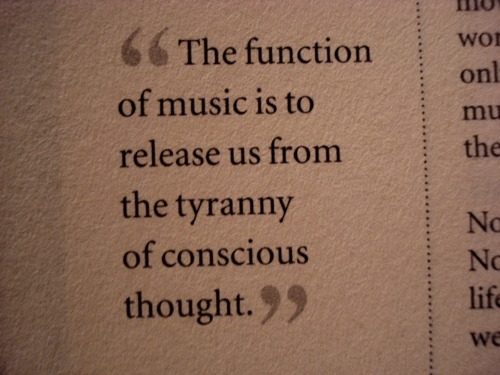 I always write to music. Love the quote. I'm working on two novels right now–so I won't NANO this year… gotta get stuff to my editor and get 'er doooone. Lola Sharp said, Music is a big part of my writing process, too. I haven't had time to make a new playlist for my nano-wip. O_O I need MORE TIME. More hours in the day would be grand and much appreciated. Have you figured out your playlist already?? Liza–Would love to have you along for the Songfest! Congrats on almost topping the 50k mark! Lola, dawling–Yes, more time would be wonderful! My playlist is mostly done. My 30 video posts are bare bones but functional. It's how I spent last Saturday night! Oops, did I just lose some cool? Thanks fellow writers and friends for paying my humble place a visit! Please have a rockin' day!!! 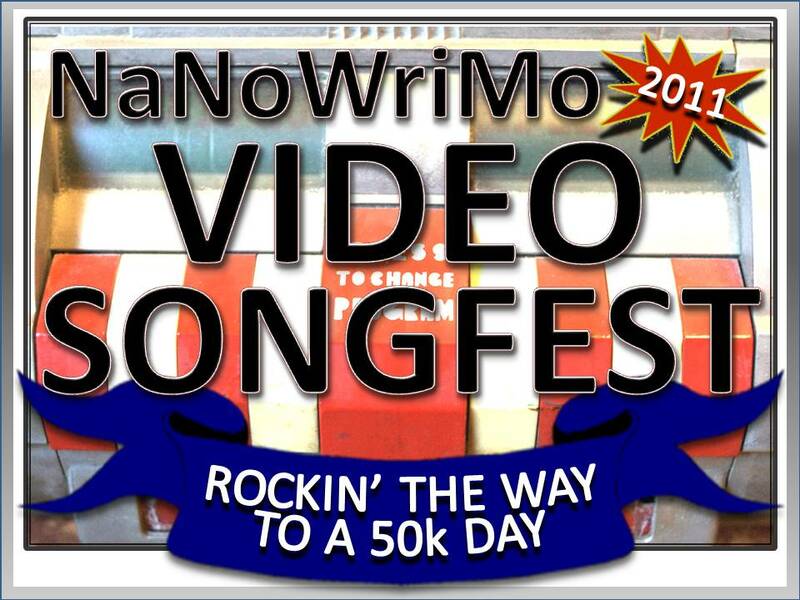 jbchicoine said, I love the idea of a NaNoWriMo Songfest! Unfortunately, I can't pull it off any better than NaNoWriMo itself! Jon Paul said, Bridget–My instructions are probably unclear. If you want to participate, you'll just need to post one video sometime in the month of November. A lot of folks seem to think it's an everyday thing–which is probably my fault. I'll be doing it every day, but only because all my words will be going in my MS! Deniz Bevan said, Brilliant! I'm so looking forward to participating in this! Deniz Bevan said, A great idea! I just posted my video.